Received: December 19, 2017; Revised: February 6, 2018; Accepted: April 24, 2018; Published online: September 1, 2018. Bone marrow (BM) is frequently used as a source of mesenchymal stem cells (MSCs) because they have a high potential for differentiation. However, it is unclear whether BM-derived MSCs lead to better clinical and magnetic resonance imaging (MRI) outcomes postoperatively. This meta-analysis compared the clinical and MRI outcomes in patients with knee osteoarthritis (OA) treated with BM-derived MSCs. Eight studies comparing the clinical and MRI outcomes assessed with various measurement tools in patients with knee OA treated with BM-derived MSCs were included. The range of motion (95% confidence interval [CI], −13.05 to 4.24; p=0.32) and MRI outcomes (95% CI, −0.16 to 1.40; p=0.12) did not differ significantly between the baseline and final follow-up. In contrast, pain (95% CI, 0.89 to 1.87; p<0.001) and functional outcomes (95% CI, 0.70 to 2.07; p<0.001) were significantly improved at the final follow-up when compared to the baseline. This meta-analysis found no significant difference in the tested range of motion and MRI outcomes between the baseline and the final follow-up in patients treated with BM-derived MSCs, whereas significant functional improvement and pain relief were noted when compared with the baseline. Thus, BM-derived MSCs appear to be a viable alternative for patients with knee OA, although long-term and high-quality randomized controlled trials are needed to confirm the clinical benefits. Osteoarthritis (OA) is a progressively debilitating condition that causes cartilage erosion of the involved joint with pain and functional impairment. Traditional methods to regenerate defects of articular cartilage include microfracture, multiple perforations, abrasions and mosaicplasty, the results of which are not satisfactory1,2). Autologous chondrocyte implantation (ACI) could be one method to regenerate an articular cartilage defect. However, ACI is not applicable to articular cartilage defects in OA because chondrocytes from patients suffering from OA have totally different biological properties3). Additionally, for large articular cartilage defects in patients with OA, an alternative cell source should be found. As an alternative, mesenchymal stem cells (MSCs) can be used to regenerative articular cartilage defects4). MSCs can be isolated from a variety of sources, such as bone marrow (BM), adipose tissue, umbilical cord, amniotic fluid, dental pulp, synovial tissue, peripheral blood and skeletal muscles. It has been reported that the BM-derived MSCs contain progenitor cells of some mesenchymal tissues, such as cartilage and other tissues5). Furthermore, BM is frequently used as a source for MSCs because they are relatively easy to isolate and they have a high potential for differentiation, even though it needs amount increases over several weeks in culture conditions for effective cellular dosage6). Although there have been many studies on adipose-derived MSCs or adipose-derived stromal vascular fraction7–10), few have assessed BM-derived MSCs and the results have been inconclusive. Previous studies have conducted a systematic review of the MSCs for the treatment of cartilage lesions11,12); however, evidence is insufficient due to the different location of cartilage defect, different cell sources, different etiology, and different MSC dosage. Few direct comparisons of clinical scores on knee outcome scales and magnetic resonance imaging (MRI) outcomes between the baseline and final follow-up have been conducted in patients with knee OA treated with BM-derived MSCs. In addition, no meta-analyses on this subject have been published. 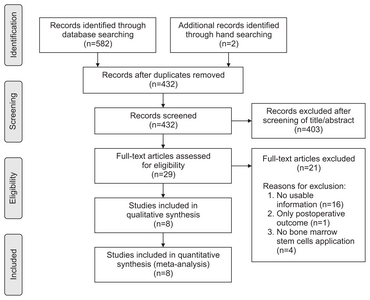 This meta-analysis was performed to assess clinical and MRI outcomes after surgery in patients with knee OA treated with BM-derived MSCs. It was hypothesized that BM-derived MSCs would lead to better clinical outcomes and MRI outcomes on final follow-up in these patients. After the initial electronic search, relevant articles and their bibliographies were searched manually. Based on the title and abstract, two reviewers independently selected the relevant studies for full review. The full text copy of each article was reviewed if the abstract did not provide enough data to make a decision. Studies were included in the meta-analysis if they (1) assessed clinical outcomes, as determined by VAS for pain, WOMAC, Lysholm score, HSS score and ROM between the baseline and final follow-up, and MRI outcomes, as determined by WORMS and PCI between the baseline and final follow-up; (2) reported direct comparisons of surgical outcomes in patients with knee OA treated with intra-articular injections of BM-derived MSCs; (3) included data on at least one of the following 7 parameters: VAS for pain, WOMAC, Lysholm score, HSS score, ROM, WORMS and PCI. For the overall functional outcome measure, we combined comparable scores from different functional outcome tools when these tools scored disability: the higher the score, the greater the disability. Using the same method, we combined comparable scores of postoperative pain: the higher the score, the greater the pain. For WORMS, we recorded total WORMS score as assessed by cartilage thickness, signal intensity, and subchondral bone alteration and volume. The higher score values indicate more damage13). PCI was evaluated using the mean T2 relaxation values sampled in 88 well-defined regions of interest: values at 100 present the worst possible PCI, and those at 5 or below are considered healthy14); (4) fully reported the number of patients in each group (baseline and final follow-up groups) and the means and standard deviations for the 7 parameters; and (5) used adequate statistical methods to compare these parameters between groups. Studies were excluded if they (1) were not original articles; (2) were pre-clinical studies; (3) had missing or inadequate outcome data, such as standard deviations or ranges of values; and (4) used open surgery as the delivery method. Two reviewers independently recorded data from each study using a predefined data extraction form and resolved any differences by discussion. Variables recorded included those associated with surgical outcomes, such as VAS for pain, WOMAC, Lysholm score, HSS score, ROM, WORMS and PCI. 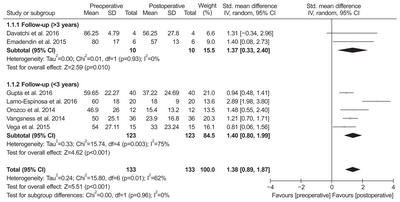 Sample size and the mean and standard deviation of surgical outcomes in each group were also recorded. If these variables were not included in the articles, the standardized mean difference (SMD) was calculated from the p-value and sample size. Two reviewers independently assessed the methodological quality of the studies using interrupted time series analyses, as recommended by the Cochrane Effective Practical and Organisation of Care Group. Each study was judged based on seven standard criteria to detect whether the intervention has an effect significantly greater than the underlying secular trend. Any unresolved disagreements between reviewers were resolved by consensus or by consultation with a third investigator. The main outcomes of the meta-analysis were the SMD for overall clinical outcomes and MRI outcomes at the final follow-up compared to the baseline values due to use of several different measurement tools, including VAS for pain, WOMAC, Lysholm score, HSS score, ROM, WORMS and PCI. For all comparisons, SMD and 95% confidence interval (CI) were calculated for continuous outcomes. Heterogeneity was determined by estimating the proportion of between-study inconsistencies due to actual differences between studies, rather than differences due to random error or chance, using the I2 statistic, with values of 25%, 50%, and 75% considered low, moderate, and high heterogeneity, respectively. All statistical analyses were performed with RevMan ver. 5.3 (The Cochrane Collaboration, Copenhagen, Denmark). The risks of bias (low, high, or unclear) were independently assessed by two investigators. Subgroup analyses based on differences in the length of follow-up time were performed for pain scores in an attempt to explore a potential source of heterogeneity. As a result, two subgroups were created: follow-up more than 3 years and follow-up less than 3 years for pain scores. In addition, sensitivity analysis was conducted by excluding one of the eligible studies at a time; two studies with additional surgical procedures, such as cartilage treatment and osteotomy were included15,16). Pooling of data was feasible for only two outcomes of interest, i.e., pain and function scores. Details on study identification, inclusion, and exclusion are summarized in Fig. 1. An electronic search yielded 270 studies in PubMed (MEDLINE), 309 in EMBASE and 3 in the Cochrane Library. Two additional publications were identified through manual searching. After removing 152 duplicates, 432 studies remained; of these, 16 were excluded based on the abstract and full-text article review, and an additional eight studies were excluded because they had unusable information or made inappropriate group comparisons. This eventually resulted in 8 studies that were included in the meta-analysis15–22). The 8 studies we examined included 161 patients who underwent surgical treatment for knee OA with BM-derived MSCs. Five studies (5 randomized controlled trials [RCTs]) compared prospectively measured parameters, whereas the other three studies compared parameters measured by retrospective chart review. Seven studies reported pain score, six reported function score, four reported MRI score, and two reported ROM (Table 1). The quality of the 8 studies included in the meta-analysis is summarized in Table 2. Publication bias could not be assessed in these trials. Tests for funnel plot asymmetry are typically performed only when at least 10 studies are included in the meta-analysis. The meta-analysis included only 8 studies, and tests for asymmetry were not performed because these tests would not be able to differentiate asymmetry from chance. Of the 8 studies, 7 compared pain score and included 133 patients assessed at the baseline and 133 at the final follow-up. The standardized mean was 1.38 points lower at the final follow-up than at the baseline, and was significantly different between groups (95% CI, 0.89 to 1.87 points; p<0.001; I2=62%) (Fig. 2). Two studies were assigned to the follow-up more than 3 years and five studies to the follow-up less than 3 years. The standardized mean in the more than 3 years of follow-up subgroup was 1.37 points lower at the final follow-up than at the baseline, and this difference was significant (95% CI, 0.33 to 2.40 points; p=0.01; I2=0%) (Fig. 2). Likewise, the value in the less than 3 years of follow-up subgroup was 1.40 points lower at the final follow-up than at the baseline, and this difference was significant (95% CI, 0.80 to 1.99 points; p<0.001; I2=62%) (Fig. 2). Six studies, including 142 patients assessed at the baseline and 142 at the final follow-up, reported function score. The standardized mean was 1.38 points lower at the final follow-up than at the baseline, and there was significant difference between groups (95% CI, 0.70 to 2.07 points; p<0.001; I2=83%) (Fig. 3). The results of sensitivity analysis were not materially differentiated from those of the original analysis (Table 3). Of the 8 studies, two compared ROM and included 24 patients assessed at the baseline and 24 at the final follow-up. The standardized mean in ROM was −4.41° lower at the baseline than at the final follow-up (95% CI, −13.05° to 4.24°; p=0.32; I2=98%) (Fig. 4). Of the 8 studies, 4 compared MRI outcome and included 87 patients assessed with MRI at the baseline and 87 at the final follow-up. The standardized mean in MRI outcome was 0.62 lower at the final follow-up than at the baseline (95% CI, −0.16 to 1.40; p=0.12; I2=82%) (Fig. 5). The main findings of the current meta-analysis verified that there were no significant differences in the tested ROM and MRI outcomes when compared to the baseline values in patients treated with BM-derived MSCs, whereas significant functional improvement and pain relief from the baseline were observed. BM stromal cells (BMSCs) can be used as a cell suspension expanded by culture or just as BM concentrate (BMC). There are some differences between these two procedures. Expanded BMSCs require two-step procedures in addition to legal approval for the clinical application and cost disadvantages. In contrast, BMC contains a mixture of different red blood cells, platelets, and leukocytes23). The adult MSC fraction is present in the leukocytes of the marrow, and their number is very limited compared to cultured MSCs. The marrow MSC and MSC precursors are extremely rare under normal conditions in human marrow before culture24). Some authors suggested that for favorable chondrogenesis, the optimal count of MSCs per cm3 is an important factor25). However, there is no study of comparison between BMSC and BMC treatment. The treatment using expanded BMSCs might be difficult to manage from a legal point of view because it might be considered as a pharmacological agent administration. In Korea, unlike BMC, expanded BMSCs need additional approval by the Korean Food and Drug Administration for the treatment of OA. In spite of the complicated procedure, whether the in vitro expansion influenced the effect of clinical application of MSCs was still unclear. For the fate of MSCs in vivo, current studies are not conclusive on this question: some have suggested MSCs differentiate and survive in vivo up to 6 months, while others suggest MSCs have a chondroinductive role of stimulating cartilage regeneration through trophic factors while slowly disappearing from the culture26). BM-derived MSCs administered into knee have adhered to the surface of a damaged tissue, have differentiated into chondrocyte, and have expressed appropriate extracellular matrix protein, resulting in anatomic restoration on the damaged tissue with a significant relief of pain and disability16,21,22). Our meta-analysis found that MRI outcomes did not show a significant difference from baseline despite the pain and functional advantages of injected BM-derived MSCs. The similar results for the MRI outcomes were likely due to the cell dose injected into the knee and culture conditions, suggesting that an optimal cell density and purity could affect the cell expansion. According to the animal study of Agung et al.27), the ideal number of MSCs that are needed for the regeneration of cartilage is known to be 1×107, and a few clinical studies report that 1×107 or more adult stem cells are ideal. Minimal criteria to define expanded multipotent human MSCs, as defined by the International Society for Cellular Therapy, include that they must be plastic-adherent when maintained in standard culture conditions, express CD105, CD73 and CD90, and lack expression of CD45, CD34, CD14 or CD11β, CD79α or CD19 and HLA-DR surface molecules, and they must be capable of differentiating into osteoblasts, adipocytes and chondroblasts in vitro28). Among our included articles, 6 studies16,19–22) met the ideal number of MSCs, 2 studies17,18) used less than 1×107 MSCs. For MSC characterization, 2 studies16,21) did not describe the expression of CD. This could result in poor MRI outcomes than expected. In our meta-analysis, the tested ROM did not demonstrate any significant difference after BM-derived MSCs administration. These results may also be partly explained by small patient samples, which can lead to reduced statistical power and less precision. Thus, the ROM outcomes of the current meta-analysis could not be extended to all knee OA patients and further investigation through a future high volume study is necessary. This study had several limitations. Of the 8 studies, 3 were observational comparison studies, which are prone to both systematic and random errors, suggesting some inherent heterogeneity due to uncontrolled bias. In addition, the heterogeneity of the included studies could be explained by slight differences in other factors affecting clinical outcomes, including the use of a wide variety of cell dose and cell processing methods29) as well as variability in functional and pain scores. This meta-analysis found no significant differences in the tested ROM and MRI outcomes in patients treated with BM-derived MSCs. On the other hand, they showed significant functional improvement and pain relief when compared with the baseline. Thus, BM-derived MSCs appear to be a viable alternative for patients with knee OA, although long-term and high-quality RCTs are needed to confirm the clinical benefits. Fig. 1. Preferred Reporting Items for Systematic Reviews and Meta-Analyses (PRISMA) flow diagram of literature selection. Fig. 2. Results of aggregate analysis for comparison of pain score between at baseline and at final follow-up. Std. : standardized, SD: standard deviation, CI: confidence interval. Fig. 3. Results of aggregate analysis for comparison of function score between at baseline and at final follow-up. Std. : standardized, SD: standard deviation, CI: confidence interval. Fig. 4. Results of aggregate analysis for comparison of range of motion (ROM) between at baseline and at final follow-up. Std. : standardized, SD: standard deviation, CI: confidence interval. Fig. 5. Results of aggregate analysis for comparison of MRI outcome between at baseline and at final follow-up. Std. : standardized, SD: standard deviation, CI: confidence interval. BMI: bone mineral density, F/U: follow-up, OCS: observational case series, IA: intra-articular, PS: pain score, ROM: range of motion, NA: not available, FS: function score, RCT: randomized controlled trial, MRIS: magnetic resonance imaging score, HTO: high tibial osteotomy. −: low risk of bias, +: high risk of bias. MD: mean difference, CI: confidence interval. Hunziker, EB (2002). Articular cartilage repair: basic science and clinical progress: a review of the current status and prospects. Osteoarthritis Cartilage. 10, 432-63. Steadman, JR, Rodkey, WG, and Rodrigo, JJ (2001). Microfracture: surgical technique and rehabilitation to treat chondral defects. Clin Orthop Relat Res, S362-9. Davatchi, F, Abdollahi, BS, Mohyeddin, M, Shahram, F, and Nikbin, B (2011). Mesenchymal stem cell therapy for knee osteoarthritis: preliminary report of four patients. Int J Rheum Dis. 14, 211-5. Somoza, RA, Welter, JF, Correa, D, and Caplan, AI (2014). Chondrogenic differentiation of mesenchymal stem cells: challenges and unfulfilled expectations. Tissue Eng Part B Rev. 20, 596-608. Pittenger, MF, Mackay, AM, Beck, SC, Jaiswal, RK, Douglas, R, Mosca, JD, Moorman, MA, Simonetti, DW, Craig, S, and Marshak, DR (1999). Multilineage potential of adult human mesenchymal stem cells. Science. 284, 143-7. Mizuno, H, Tobita, M, and Uysal, AC (2012). Concise review: adipose-derived stem cells as a novel tool for future regenerative medicine. Stem Cells. 30, 804-10. Freitag, J, Ford, J, Bates, D, Boyd, R, Hahne, A, Wang, Y, Cicuttini, F, Huguenin, L, Norsworthy, C, and Shah, K (2015). Adipose derived mesenchymal stem cell therapy in the treatment of isolated knee chondral lesions: design of a randomised controlled pilot study comparing arthroscopic microfracture versus arthroscopic microfracture combined with postoperative mesenchymal stem cell injections. BMJ Open. 5, e009332. Koh, YG, Kwon, OR, Kim, YS, Choi, YJ, and Tak, DH (2016). Adipose-derived mesenchymal stem cells with microfracture versus microfracture alone: 2-year follow-up of a prospective randomized trial. Arthroscopy. 32, 97-109. Bansal, H, Comella, K, Leon, J, Verma, P, Agrawal, D, Koka, P, and Ichim, T (2017). Intra-articular injection in the knee of adipose derived stromal cells (stromal vascular fraction) and platelet rich plasma for osteoarthritis. J Transl Med. 15, 141. Frisbie, DD, Kisiday, JD, Kawcak, CE, Werpy, NM, and McIlwraith, CW (2009). Evaluation of adipose-derived stromal vascular fraction or bone marrow-derived mesenchymal stem cells for treatment of osteoarthritis. J Orthop Res. 27, 1675-80. Afizah, H, and Hui, JH (2016). Mesenchymal stem cell therapy for osteoarthritis. J Clin Orthop Trauma. 7, 177-82. Yubo, M, Yanyan, L, Li, L, Tao, S, Bo, L, and Lin, C (2017). Clinical efficacy and safety of mesenchymal stem cell transplantation for osteoarthritis treatment: a meta-analysis. PLoS One. 12, e0175449. Peterfy, CG, Guermazi, A, Zaim, S, Tirman, PF, Miaux, Y, White, D, Kothari, M, Lu, Y, Fye, K, Zhao, S, and Genant, HK (2004). Whole-Organ Magnetic Resonance Imaging Score (WORMS) of the knee in osteoarthritis. Osteoarthritis Cartilage. 12, 177-90. Orozco, L, Munar, A, Soler, R, Alberca, M, Soler, F, Huguet, M, Sentis, J, Sanchez, A, and Garcia-Sancho, J (2013). Treatment of knee osteoarthritis with autologous mesenchymal stem cells: a pilot study. Transplantation. 95, 1535-41. Wong, KL, Lee, KB, Tai, BC, Law, P, Lee, EH, and Hui, JH (2013). Injectable cultured bone marrow-derived mesenchymal stem cells in varus knees with cartilage defects undergoing high tibial osteotomy: a prospective, randomized controlled clinical trial with 2 years’ follow-up. Arthroscopy. 29, 2020-8. Vangsness, CT, Farr, J, Boyd, J, Dellaero, DT, Mills, CR, and LeRoux-Williams, M (2014). Adult human mesenchymal stem cells delivered via intra-articular injection to the knee following partial medial meniscectomy: a randomized, double-blind, controlled study. J Bone Joint Surg Am. 96, 90-8. Davatchi, F, Sadeghi Abdollahi, B, Mohyeddin, M, and Nikbin, B (2016). Mesenchymal stem cell therapy for knee osteoarthritis: 5 years follow-up of three patients. Int J Rheum Dis. 19, 219-25. Emadedin, M, Ghorbani Liastani, M, Fazeli, R, Mohseni, F, Moghadasali, R, Mardpour, S, Hosseini, SE, Niknejadi, M, Moeininia, F, Aghahossein Fanni, A, Baghban Eslaminejhad, R, Vosough Dizaji, A, Labibzadeh, N, Mirazimi Bafghi, A, Baharvand, H, and Aghdami, N (2015). Long-term follow-up of intraarticular injection of autologous mesenchymal stem cells in patients with knee, ankle, or hip osteoarthritis. Arch Iran Med. 18, 336-44. Gupta, PK, Chullikana, A, Rengasamy, M, Shetty, N, Pandey, V, Agarwal, V, Wagh, SY, Vellotare, PK, Damodaran, D, Viswanathan, P, Thej, C, Balasubramanian, S, and Majumdar, AS (2016). Efficacy and safety of adult human bone marrow-derived, cultured, pooled, allogeneic mesenchymal stromal cells (Stempeucel®): preclinical and clinical trial in osteoarthritis of the knee joint. Arthritis Res Ther. 18, 301. Lamo-Espinosa, JM, Mora, G, Blanco, JF, Granero-Molto, F, Nunez-Cordoba, JM, Sanchez-Echenique, C, Bondía, JM, Aquerreta, JD, Andreu, EJ, Ornilla, E, Villaron, EM, Valenti-Azcarate, A, Sanchez-Guijo, F, Del Canizo, MC, Valenti-Nin, JR, and Prosper, F (2016). Intra-articular injection of two different doses of autologous bone marrow mesenchymal stem cells versus hyaluronic acid in the treatment of knee osteoarthritis: multicenter randomized controlled clinical trial (phase I/II). J Transl Med. 14, 246. Orozco, L, Munar, A, Soler, R, Alberca, M, Soler, F, Huguet, M, Sentis, J, Sanchez, A, and Garcia-Sancho, J (2014). Treatment of knee osteoarthritis with autologous mesenchymal stem cells: two-year follow-up results. Transplantation. 97, e66-8. Vega, A, Martin-Ferrero, MA, Del Canto, F, Alberca, M, García, V, Munar, A, Orozco, L, Soler, R, Fuertes, JJ, Huguet, M, Sanchez, A, and Garcia-Sancho, J (2015). Treatment of knee osteoarthritis with allogeneic bone marrow mesenchymal stem cells: a randomized controlled trial. Transplantation. 99, 1681-90. Martin, I, Baldomero, H, Bocelli-Tyndall, C, Passweg, J, Saris, D, and Tyndall, A (2012). The survey on cellular and engineered tissue therapies in Europe in 2010. Tissue Eng Part A. 18, 2268-79. Simmons, PJ, and Torok-Storb, B (1991). Identification of stromal cell precursors in human bone marrow by a novel monoclonal antibody, STRO-1. Blood. 78, 55-62. Skowronski, J, and Rutka, M (2013). Osteochondral lesions of the knee reconstructed with mesenchymal stem cells: results. Ortop Traumatol Rehabil. 15, 195-204.
de Windt, TS, Hendriks, JA, Zhao, X, Vonk, LA, Creemers, LB, Dhert, WJ, Randolph, MA, and Saris, DB (2014). Concise review: unraveling stem cell cocultures in regenerative medicine: which cell interactions steer cartilage regeneration and how?. Stem Cells Transl Med. 3, 723-33. Agung, M, Ochi, M, Yanada, S, Adachi, N, Izuta, Y, Yamasaki, T, and Toda, K (2006). Mobilization of bone marrow-derived mesenchymal stem cells into the injured tissues after intraarticular injection and their contribution to tissue regeneration. Knee Surg Sports Traumatol Arthrosc. 14, 1307-14. Dominici, M, Le Blanc, K, Mueller, I, Slaper-Cortenbach, I, Marini, F, Krause, D, Deans, R, Keating, A, Prockop, Dj, and Horwitz, E (2006). Minimal criteria for defining multipotent mesenchymal stromal cells: the International Society for Cellular Therapy position statement. Cytotherapy. 8, 315-7. Xia, P, Wang, X, Lin, Q, and Li, X (2015). Efficacy of mesenchymal stem cells injection for the management of knee osteoarthritis: a systematic review and meta-analysis. Int Orthop. 39, 2363-72.